Just so you know, this gave me a reason to go digging through the loft tomorrow to find my legacy head unit. I took the sound system from the Svx and put it in my legacy when it became my daily driver, and i've just not had one since. My original SVX cd and stereo I ebayed, so now I have something until I decide what to do with the sound. I was thinking about building a computer, but still not sure. I figured that the units could probably swap, and now you've confirmed it. Last edited by Speedklix; 05-06-2006 at 11:21 PM. Of course their connectors are different . . . Look where the damn steering wheel is! To clarify: The wiring harness connector are different. But these Panasonic headunits are the old pull-out type (with a swing out handle). They have a cage which fits into the dash and connects to the wiring harness. Then the headunit slides into the cage. The contacts on the back of the headunit engage with contacts at the back of the cage. What I've discovered is that the cages are identical, except for the harness connector. So the Legacy radio can be slotted into the SVX radio cage (and vice versa if you wire up the extra power pin which is missing on the Legacy radio cage). That's fascinating. That sounds like the old-style "security" feature -- where you remove the whole radio and take it with you. I didn't know that any factory radios did that. Does the UK Legacy's harness look like this? For more information than you ever wanted to know about other Subaru models' radios (at least in North America), see this thread I put together on NASIOC. You'll need to create a free account to view the images. 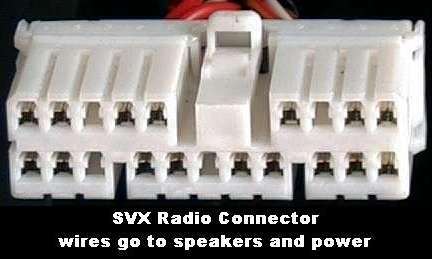 And here's my SVX Radio Installation Guide. Last edited by SVXdc; 10-25-2009 at 12:57 PM. An SVX owner in Sweden e-mailed me asking about differences between his radio and what I describe in my installation document. He said his radio is similar to what's shown in the attached PDF, from a German owner. That radio is the Panasonic model RD25 (sticker on bottom says Model No. 86201PA060, Ref. No. CQ-YF4220A). [right picture] View of jack on the radio, mounted in the rear, and associated plug on the quick-out bracket. The other socket / plug (not shown here) is for the CD changer control. That reminded me of these pictures that another owner in the UK had sent me awhile back. That was the first time I had seen the radio in a UK SVX. Click these thumbnails for larger images. Occasionally, the thumbnails will not show, but each also has an "o" which you can click. Last edited by SVXdc; 02-02-2009 at 06:11 PM.